Streaking Seton Hall knocked off No. 3 Villanova in Saturday’s Big East tournament final and heads into the NCAA tournament with a full head of steam. NEW YORK — The shame was in the ending—not its manner but the fact of it, that it came after just the regular 40 minutes and maybe at all. Saturday’s Big East tournament final between Seton Hall and Villanova was such an eyes-wide-open, Saturday-night-at-the-Garden classic that it seemed unfair that it would end just as its build reached fever pitch. That there would be no more dueling between the Pirates’ Isaiah Whitehead and the Wildcats’ Kris Jenkins. That there would be no more and-ones. That there would be no more decibel-raising, game-tying threes, no more Ryan Arcidiacono flying over press row into the stands chasing a loose ball, no more tourney shoo-ins from a major conference playing like two small schools locked in an auto-bid do-or-die. That after Whitehead’s soaring, rattle-around-the-rim layup while being fouled and his ensuing go-ahead free throw with 18.5 seconds left, that after Jenkins missed a long three and Josh Hart missed a put-back amidst a flurry of physicality, that after one last Arcidiacono prayer fell short, the game was over: Seton Hall 69, Villanova 67. And only in the ending could there be the reward, the just deserts for a Pirates team that spent last season in a tailspin, February on the bubble, and this week knocking off the Big East’s biggest seeds to win the program’s first conference championship in all but one of its players’ lifetimes. Twenty-three years had passed since any Pirates player had that feeling, and this was not supposed to be the season that it returned. Last season’s team had followed a 12–2 start with a 4–13 finish then saw its leading scorer and would-be lone returning senior, Sterling Gibbs, siphoned off via transfer to UConn. 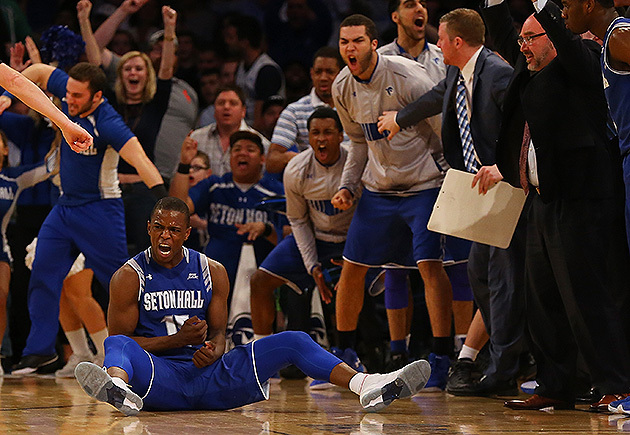 The Big East’s preseason poll picked the Pirates seventh out of 10 teams. 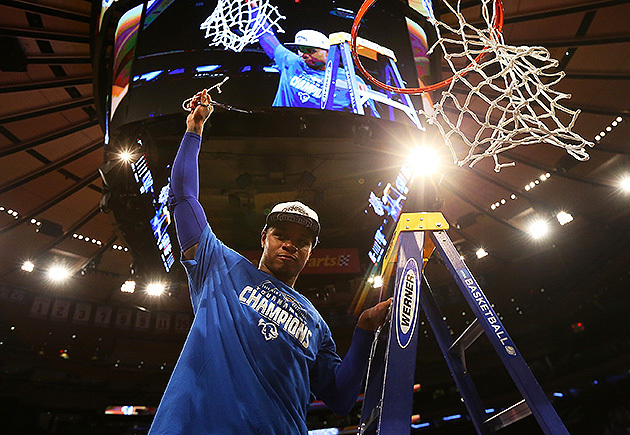 (“I was actually excited,” coach Kevin Willard said Saturday. “I thought we were going to be eighth or ninth.”) But their defense tightened and upped its peskiness, Gordon transferred in from UMass to provide a veteran leader and defender, and a somewhat disappointing batch of last year's freshmen—guards Whitehead and Khadeen Carrington, and forwards Desi Rodriguez, Angel Delgado, and Ismael Sanogo—grew into the core of a contender. For much of Saturday’s first half it seemed there would be no drama in his prediction’s fulfillment. Seton Hall came out blazing from beyond the arc, making five of its first six three-point attempts, and scoring easily around the rim while Villanova big man Daniel Ochefu hobbled in and out of the game on his sprained right ankle. But an 11-point halftime lead was wiped in large part by Jenkins’s 16 second-half points, highlighted by a banked three from the left wing to tie the game with 9:21 left. Eight fist-tight minutes later came a final 60-second showdown between the game’s two stars. A trey by Jenkins to put Villanova up three. One of two free throws by Whitehead to cut it to two. And then, after a trap by Carrington, Gordon and Sanogo forced a Josh Hart turnover, the go-ahead bucket, when Whitehead blew past Ochefu along the right of the key and collided with Jenkins on the right block. “I saw Kris Jenkins coming over,” Whitehead explained, “and I knew that he wouldn’t be able to get in position fast enough for me to draw a charge. I just tried to lay it in on him.” For nearly two seconds the ball skipped around above the net before dropping through to tie the game and give Whitehead the chance to take the lead at the line. From his seat along the baseline, next to the Seton Hall cheerleaders, Whitehead looked up and flexed both biceps. It is a play that will live on in Big East tournament highlight reels and certainly in Seton Hall lore. After Jenkins’s miss on the other end, Hart appeared to be fouled on an attempted put-back amid a trio of Pirates defenders. But he did not blame the swallowed whistle for the outcome. • THAMEL: Will lackluster regular season hurt the NCAA tournament? And he has combined a knack for fearless drives and pretty floaters with a flair for the theatric. After hearing that Steve Lavin, the former St. John’s coach who works as a Big East analyst for Fox Sports 1, had predicted the Pirates would lose their quarterfinal game to Creighton due to a lack of maturity, Whitehead crowed about it in the postgame: “Hey, we proved him wrong I guess.” (Lavin, to his credit, enjoyed making light of it during a postgame interview with Whitehead the next night.) During a replay review with three minutes left of Seton Hall’s semifinal win over Xavier, Whitehead turned to TV broadcaster Gus Johnson and said, “We want Villanova.” Then there was the flex after the game-tying bucket against Villanova, and the exaggerated, leg-kicking “BOOM!” exclamation after a first-half three. The talk around the Wildcats this time of year is predictably centered on whether this will be the season that they finally advance to the NCAA tournament’s second weekend for the first time since 2009. In that span they have lost five times as the higher seed, including second-round losses as a No. 2 in 2014 (to eventual champion UConn) and as a No. 1 last season (to North Carolina State). The concerns typically center on the team’s lacking makeup, undersized lineup, or reliance on threes. But the primary worry for Villanova right now is the right ankle of Ochefu, the versatile 6'11" center around whom so much of its offense (via not only scoring but also screens and hand-offs) and defense (via shot-blocking and switches) revolve. Ochefu averaged just over 15.7 minutes over three Big East tourney games, averaging 4.3 points and 2.7 rebounds, but more importantly limping while running and looking unlike himself for long stretches of time. Against Seton Hall he was blocked from behind by Whitehead on one shot attempt, then later clanked a turnaround layup attempt hard off the backboard. When he was matched up on Whitehead for the game-deciding drive, he appeared to stand no chance of staying with him. In mid-January, after the Pirates had been handled by Creighton for a second straight loss, Gordon called a team meeting. He had not been part last season’s disastrous finish, he said, but he had heard about the rifts within the team as the losses piled up. “I didn’t want it to go that way,” Gordon said.